Close to the train station, good bed and shower for the price. Breakfast is ok, not much western food options though. Hotel is clean and staff is friendly and cooperative. The breakfast is also tasty. The room was nice and comfy. Breakfast was good: Toast, jam, butter. Coffee, tea(s). Fried eggs, boiled eggs, scrambled eggs. Chicken, pork sausages. Noodles, fried rice. Steamed buns. Stir fry veg. Choose your ingredients and they make a noodle dish for you. Congee. Westerners will give it a thumbs up. Overall, it was value for money we spent. The place was clean. And even though the kitchen Staff couldn't speak english the were helpful and smiley. Poor service level maybe because of the measurement of service is very different. Coffee is lousy , food is not nice at all. Room card not working for most of client . Holiday Inn Express Shanghai Putuo is a 7-minute drive from Jing’an Temple, 9-minute drive from Jade Buddha Temple and 10-minute drive from Zhongshan Park. Hongqiao International Airport is 8.7 mi away. The hotel features a business center and a self-service laundry area. Ice machines and a safety deposit box at the front desk are available. 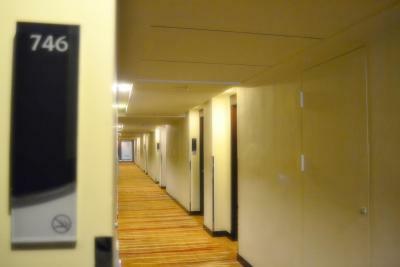 Additionally, rooms and facilities for disabled guests are provided as well. When would you like to stay at Holiday Inn Express Shanghai Putuo? The room comes with free toiletries, a mini-bar and a safety box. Please note that guests are required to specify their bedding preferences upon check-in (subject to availability). The room features a 32-inch TV, a iPod docking station. The bathroom is fitted with a smartly designed shower and a bathtub. Located on high floors, room offers a queen-sized bed and floor-to-ceiling windows with views of the garden and Suzhou River. 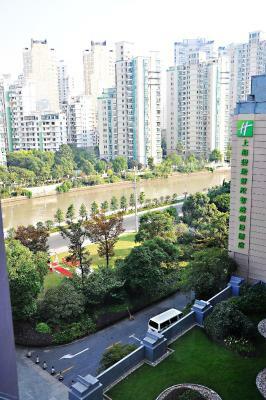 Offering views of Suzhou river, the room comes with free toiletries, a mini-bar and a safety box. Offering views of Suzhou river and landscaped garden, room offers free breakfast, a 32-inch flat-screen cable TV and an private bathroom with a bathtub. House Rules Holiday Inn Express Shanghai Putuo takes special requests – add in the next step! One additional older child or adult is charged CNY 105 per person per night in an extra bed. Holiday Inn Express Shanghai Putuo accepts these cards and reserves the right to temporarily hold an amount prior to arrival. Please note free shuttle bus to Subway Stations (Line 11, 3 and 4) are available at 8:00-9:00 from Monday till Friday. Location is away from the hustle and bustle. Might be a little quiet for people. Buffet breakfast was good but perhaps a little limited for seasoned travellers. Reception staff weren't too proficient in English - which created a little barrier. Could have done with a simple "Welcome to Holiday Inn! Its a pleasure to have you as our guest!" Staff at the reception speak very bad English, had to use translator pretty much all the time. The front staff couldn't speak english when I arrived. Kitchen staff didn't speak english. Ordering food and drinks was a hastle. Outside the hotel, fine you expect that. But inside an international hotel I shouldn't need to use Google translate. Breakfast was cold everyday, every single day I was there. I went down at 0530 for a 6am open and it was cold. Worst breakfast of any place ove visited around the world. The place is being renovated and it a building site outside. They say work stops at 530... It doesn't. The English-speaking ability of the front desk staff has to improve in order for one to completely enjoy their experience. The breakfasts could use more variety. Some of the staff couldn't speak english. I liked that it was a quiet place. Breakfast could improve - to include western travelers. breakfast is very poor and air condition in the room was not working the first night after that I make problem with them. the staff dose not speak English . the subway very far from hotel we need a taxi every time to comeback . Room is ok ,clean , comfortable.